For most of my life I hated running. Hated it. I tried several times in my life to become a runner, and failed miserably several times. My dad claims that I ran a very fast mile on the local college track when I was 8 years old, and that he had great hopes for my future as a runner. But the older I got, the dimmer my athletic future seemed. By the time I was a teenager, I was doing my best to get out of P.E. requirements by joining school theater productions and managing the track team. In fact, I don't think I ran a nonstop mile once between the ages of 8 and about 23. In 1998 I entered my first-ever race, the Bastille Day 5k in Chicago. I tried to get into running for the 8 weeks leading up to the race, but oh the pain! in my legs! and my lungs! I ran the first mile, walked the second mile, and run-walked the third mile. I finished in about 37 minutes, and proudly enjoyed my post-race beer. But I hated every painful step. A year later I read an article in the local paper about Team in Training. Feeding a long-harbored desire to do something that would surprise people, to do something athletic, I signed up for their marathon-training program. But not to run -- I signed up to walk a marathon. My coach was phenomenal. And the program was the perfect gentle introduction to the world of endurance sports. We learned about proper shoes, wicking clothing, sports lubricants, and what those weird little foil "sports gel" packets were for. I walked my first marathon in 5 hours and 38 minutes. That's just under a 13-minute mile. You go out and try to walk a mile under 13 minutes. That is a BRISK walking pace. After a second marathon with TNT, I got it into my mind that I wanted to do a triathlon. So in October of 2000, five years ago this month, I started running for the last time. I ran for 30 seconds -- about as far as I could go -- and walked for four minutes until the pain in my shins subsided and my racing heart rate calmed down. I repeated the thirty seconds/four minutes routine maybe six times. And then I did it again a couple of days later. The next week I ran for a minute at a time and reduced the walking part. It was humiliating to me, only being able to run for a minute at a time, but I knew I had to start somewhere. And then I ran two minutes, walked three. Ran five, walked two. After maybe eight weeks, I ran a mile straight on a treadmill. That accomplishment was huge. The following March -- five months after I started -- I ran a 4.5-mile race around Lake Merced in 48 minutes non-stop. In my training log I drew a celebratory starburst around the day. That was the first time in my life I had ever run more than a mile without a break. Meanwhile, I had bought an entry-level road bike and started taking swimming lessons early in 2001. And I did my first triathlon that June. It was a Danskin race, one of those all-women events famous for bringing hordes of women into the sport. It was hard as hell for me, but I loved it. The rush of crossing the finish line got me hooked on racing. As much as I was addicted to triathlon, I was even more in love with running. With how easy it was to put on shoes and go outside, morning or night, rain or fog, no pumping tires, no walking to the pool. I ran my first marathon in 2002, in just under five painful hours. I wasn't very well prepared, and I walked a lot of it. I ran another later that year, having lost a good amount of weight. 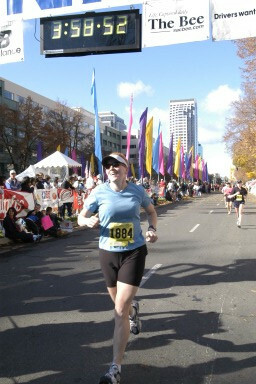 I have run at least one stand-alone marathon (not including triathlons) every year since then. I have come a long way in five years, so it frustrates me when healthy people tell me they "can't" run. Most of these people just don't want to run, and that's just fine. But people: if I can do it, anyone can. Did I mention how much I hated running for the first 25 years of my life? It took a huge amount of desire, discipline, and -- honestly -- pain to get to the point that I enjoyed running. But the payoff has been huge. Here's the thing: running is HARD! And if, like me, you are starting from scratch and you want to get good at it, you have to start small, and be persistent, I mean really be stubborn. You have to stick with it for a long time. If you do, it will be worth it, I promise. Pure happiness (and relief). I finish my first sub-4-hour marathon, Dec. 7, 2003. Some day my internal inspiration will come; in the meanwhile, I live vicariously through you! I can't even begin to imagine how difficult it would be to walk an entire marathon. I'll bet the sub four was easier and a lot more fun. I think you've come farther in 5 years than I've come in a lifetime of running, pretty amazing.